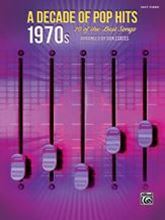 These Easy Piano arrangements of chart-topping tunes of the 1970s are sheer fun to play. Fingerings, lyrics, and chord symbols are included. Titles: Bridge over Troubled Water (Simon & Garfunkel) * Dancing in the Moonlight (King Harvest) * Dancing Queen (ABBA) * Don't It Make My Brown Eyes Blue (Crystal Gayle) * Evergreen (Barbra Streisand) * Go Your Own Way (Fleetwood Mac) * Gonna Fly Now (Theme from Rocky) * How Deep Is Your Love (Bee Gees) * Killing Me Softly (Roberta Flack) * Love Story (Where Do I Begin) (Love Story) * Mamma Mia (ABBA) * Moondance (Van Morrison) * Stairway to Heaven (Led Zeppelin) * Stayin' Alive (Bee Gees) * Superstar (The Carpenters) * Take Me Home, Country Roads (John Denver) and many more.